This 1886 Frontier-style Victorian, built by a local railroad tycoon, is the perfect embodiment of Santa Fe's history. 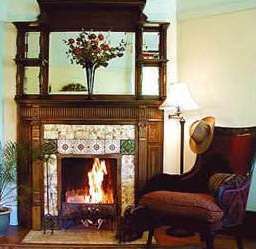 Tucked away on a quiet street near the Plaza and Canyon Road and surrounded by a lush and peaceful garden, the inn features beautiful stained glass, ornate fireplaces, unique architectural details and period antiques. 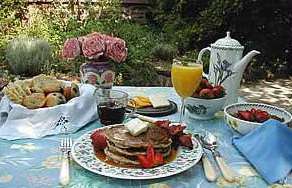 In the morning enjoy a bountiful hot breakfast such as French toast, flapjacks or frittatas. Accompany your hot entree with scrumptious homemade muffins and granola, whole grain breads, yogurt, cheeses and fresh fruit salad. In the afternoon savor decaden sweet treats, refreshing lemonade or iced tea in the expansive garden. We pride ourselves in our absolutely heavenly beds, made up with 100% cotton sheets, down comforters and feather pillows. For your comfort and convenience, we provide phones with voicemail and dataports, cable TV, in-room massage and incredibly soft robes. Our staff is truly dedicated to warm and personal service.